BEIJING, April 13, 2017 — (PRNewswire) — International action film star Jackie Chan unveiled his new 3D cartoon series - All New Jackie Chan Adventures - China's first international standard high budget animation production - at a press conference in Beijing, China today. The new US$6m, 104 episode cartoon series will feature the epic adventures of a cartoon version of Jackie Chan, but designed for the first time to appeal to young Chinese audience, following the success of the American animated TV series, Jackie Chan Adventures, which was an international hit in the early 2000s. All New Jackie Chan Adventures will debut later this year and bring the adventures and comedy that are popular in Jackie's films into a cartoon context, and will also star child actor Kyana Poppy Downs as the main character's trusted partner and classmate. The premise of the new cartoon series, centers on a team of protagonists guarding against monsters who threaten the 'dreamlands' - so that every child can have sweet dreams at night. All New Jackie Chan Adventures is set to raise the bar for China's animation industry in general; becoming the first Chinese-funded cartoon series to be made to international production standards. While the show has been conceived to win the hearts of Chinese children, the team also plans to roll out All New Jackie Chan Adventures to international markets. The previous hit series, Jackie Chan Adventures, which aired from 2000-2005 set off a craze among audiences in 60 countries since it was aired on Kid's WB - and the team plans to go global once more. All New Jackie Chan Adventures has been created following detailed research into the cultural nuances of how to engage young Chinese minds - a first in the animation industry in China. Comprehensive research focused on the psychological needs and viewership habits of Chinese children through five-rounds of research over one and a half years, and surveyed students from (6-8 years old) at grade 1-3 of primary schools in seven Chinese cities including Beijing, Shanghai, Xi'an, Shenyang, Zhongshan, Chengdu and Changsha. The team of researchers concluded that viewers preferred subject matter involving comedy, magic and adventure, illustrated through bright and eye-catching colours. Further rounds of research helped give the producers insights into how best to build out the image of the leading role, how the characters should be designed, as well as to devise appropriate supporting characters and scenes. The series also promotes positive values for the young audiences, with storylines embodying Chinese etiquette and traditional virtues, teaching good habits and discipline, principles which mirror Jackie Chan's own beliefs and practices. "With young children increasingly searching for new role models to look up, it is imperative that celebrities in China use their influence to help shape the values of today's young Chinese children and indeed people in general," said Jackie Chan. 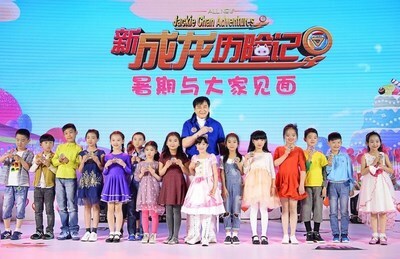 After receiving extremely positive feedback from major broadcasting channels in China and overseas, the first season is already scheduled on at least three children's satellite TV channels and 200 terrestrial TV channels in China, including Hunan TV Children's Channel, BTV's Kaku Children's Channel, Toonmax TV, and more. An intellectual property-based multi-channel model is planned for All New Jackie Chan Adventures that will also extend its influence beyond the TV series to be featured in videogames, in product franchising, stage plays, books, and in theme parks with an aim to unleash the full potential value of this series across the industry chain. "This new cartoon series is not limited to the TV screen. In many ways, it will be children's companion as they grow up," Jackie Chan said at the event. Beloved for his comic timing, acrobatic fighting style and innovative stunts, Jackie Chan has appeared in more than 200 movies since becoming a child actor in his native Hong Kong in the 1960s. One of the few celebrities in the world so famous that he hardly needs introducing, his Hollywood breakthrough came with Rumble in the Bronx in 1996, and he has gone on to be become a global star through the Rush Hour movies, Shanghai Noon, The Karate Kid and the Kung Fu Panda series of animated films. After a glittering career spanning five decades in the film industry, including directing and producing, he received an honorary Oscar in 2016. Production Company: Zhejiang Talent Television&Film Co., Ltd, Khorgas JJ Culture Media Co., Ltd, and VJ Animation Studio.